Chubritza offers a vibrant and eclectic mix of international vocal and instrumental folk music performed on a wide variety of traditional and modern instruments. 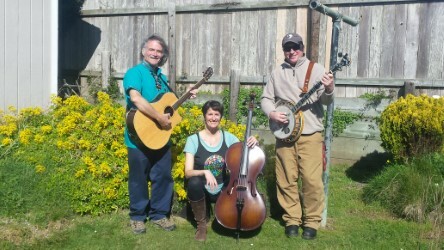 The band plays frequently for dances, concerts, weddings, and arts events in the Humboldt area, as well as folk dance festivals in Central California, Oregon, and a concert tour in Israel. Good Company is Humboldt County’s premier acoustic trio specializing in Celtic and British acoustic trad folk, with detours into Old Time, French and Scandinavian music. Good Company has been bringing together the fine vocal and instrumental musicianship of Sam McNeill (violin, guitar, cittern, accordion, nyckelharpa), Bob Stockwell (mandolin, violin, guitar) and Janet Finney (flutes & whistles, small percussion) for 26 years. Crested Hens are crafty world musicians bringing out the full flavors and rich traditional melodies of Celtic music, and are presently from in and around Arcata. They have played together as a trio for about a year and are known for their exhilarating tunes and rousing songs from Ireland and other Celtic lands as well as for their original music. Coast, comes a professional band that has kept the tradition of Bluegrass alive, as well as becoming a tradition in themselves. Performing often in many of the same local venues in which they started over 20 years ago, the group has brought progressive song choices to a point of mellowness and balance. With a tight, driving sound they play bluegrass standards and perform their own material, songs and instrumentals.